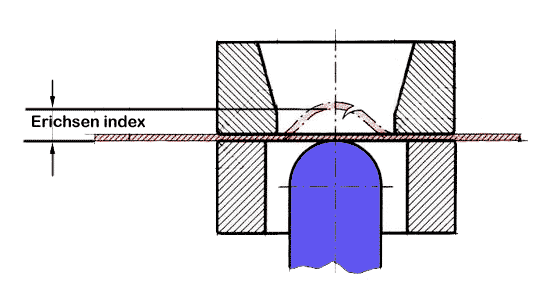 A measure of the ductility of sheet metal. Abbr, IE. It is used to determine the metal's suitability for the metal-forming technique called “drawing.” Such items as small seamless metal boxes are made by drawing. The sheet metal to be tested is clamped between two dies, and a punch with a hemispherical end is forced into it at a slow, controlled speed until the metal cracks. The Erichsen test is common in Europe, in fact, the man who invented the test in 1913 founded a company that remains a prominent supplier of test instruments. In the United States, the Olsen cupping test and the test prescribed by the ASTM are more common. Alloy steels are commonly used in the heat treated condition, as strength increases are not commensurate with increases in production costs for annealed alloy steels. Corresponding strength values are accordingly shown for annealed alloy steels and for such steels after having been given certain recommended heat treatments of the Society of Automotive Engineers. The heat treatments followed in obtaining the properties shown are outlined on the pages immediately following the tables on steel. It will be noted that considerable latitude is allowed in the indicated drawing temperatures and corresponding wide variations in physical properties may be obtained with each heat treatment. The properties vary also with the size of the specimens heat treated. The drawing temperature is shown with the letter denoting the heat treatments wherever the information is available. Smithsonian Physical Tables, 7th revised edition, rev. 1921 reprint ed. Smithsonian Miscellaneous collections, vol. 71, no. 1. Washington, DC: Smithsonian Institution, 1921. Last revised: 22 August 2013.